Saint Arnold Brewery played host to the first ever Houston Vs. Austin Barbecue Throwdown last weekend. 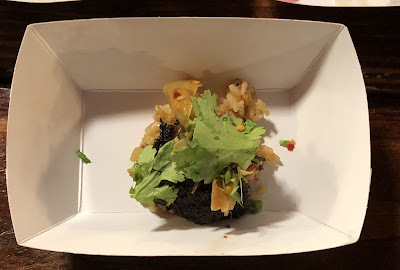 The theme of the annual Houston Barbecue Throwdown persisted to this event: Create a unique barbecue dish & create it better than the other guys. 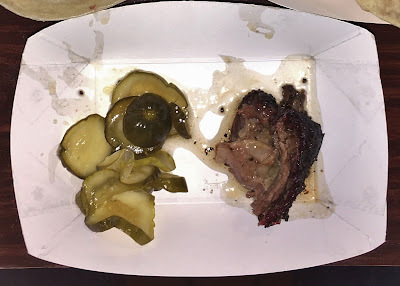 This event however, did play up a budding Houston vs. Austin rivalry in the world of smoked meats. As has been the case with the other Houston Throwdown events, this Throwdown was a perfect celebration of Texas Barbecue. 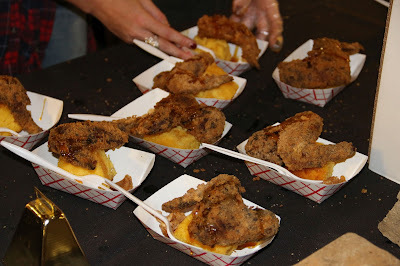 The masterminds behind the Houston Barbecue Festival deserve heaps of praise for always pulling off brilliant events. If those guys are in charge, it is seriously an event that you need to attend. When Houston and Austin are Pit against each other in the realm of barbecue, we all win. But, individual winners were also named. 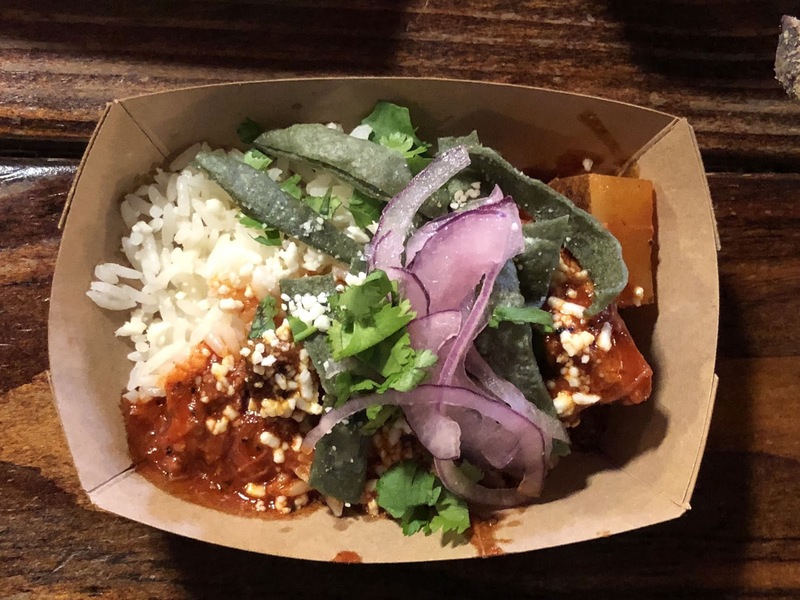 No one won bigger than Austin's LeRoy & Lewis Barbecue who took home not only the People's Choice Award and a share of the Judge's Choice Award, but also earned my personal vote (!) for their Pork Bacon Ribs with Brisket Fried Rice. 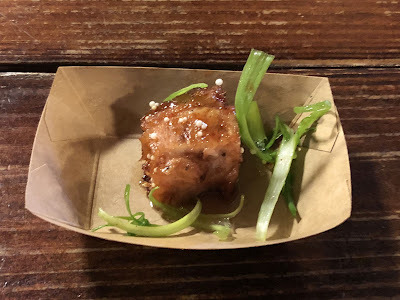 This seriously may have been one of the best bites I've had at any of these events. Austin-area Brotherton's Black Iron Barbecue took the other share of the Judge's Choice Award for their precisely crafted Bahn Mi Crostini layered with three different types of delicious meat. 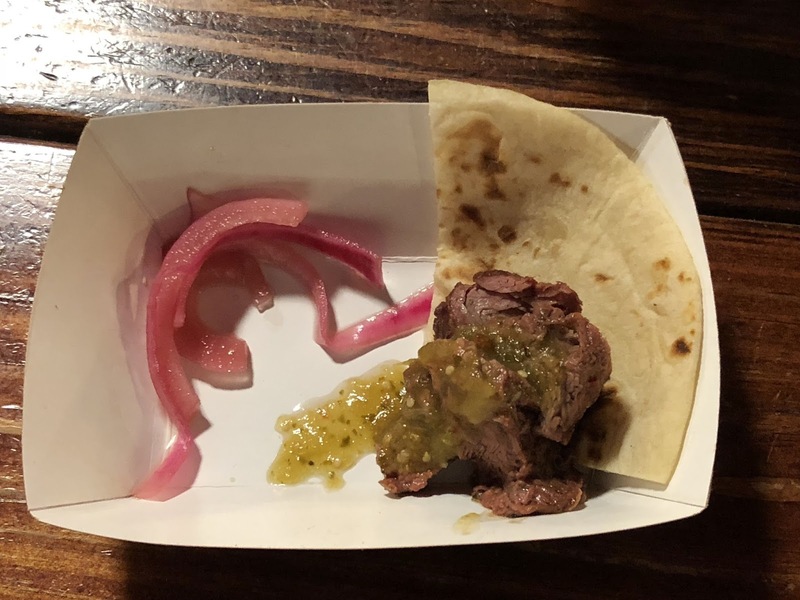 Both Austin-area joints are newer, lesser known commodities, especially to the Houston market, but both were definitely deserving of the praise they received at the event. 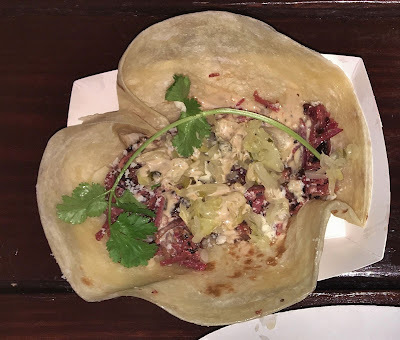 Houston's Pit Room, Austin-area Valentina's Tex-Mex BBQ, and Houston's Harlem Road Barbecue rounded out the judge's top five in a very competitive field. I also thought that My Yard Reaction and Beaver's were both impressive in their follow-up to their superb Houston Barbecue Throwdown debut in September. 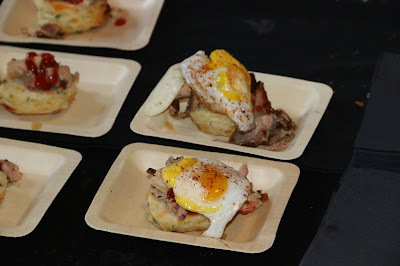 Last weekend marked the 3rd Annual Houston Barbecue Throwdown at Saint Arnold Brewery. 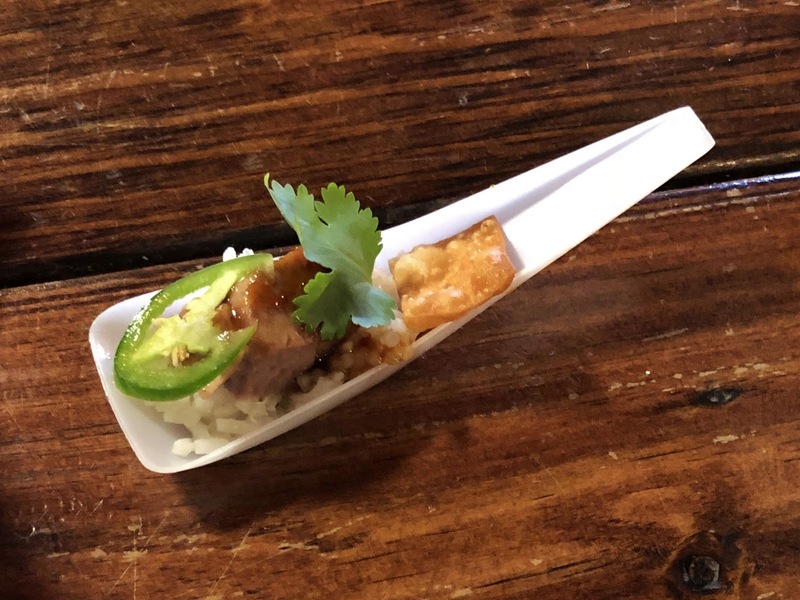 As always, the intent of the Throwdown is for local competitors to create unique Houston-style barbecue dishes. Houston is so diverse, the definition of “Houston-style barbecue” can have any number of interpretations. And the event always displays a variety of really well executed plays on this idea. For three consecutive years now, I have babbled about this being my favorite event of all, so I’ll skip the flowery language and simply discuss the event. 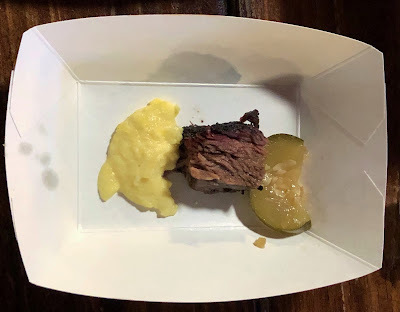 The big story of the day was Tin Roof BBQ suffering a fire early the morning of the Throwdown and yet, still participating – and WINNING the People’s Choice Award for their outstanding Beef Rib. Their first award at the event made for a really inspiring moment. 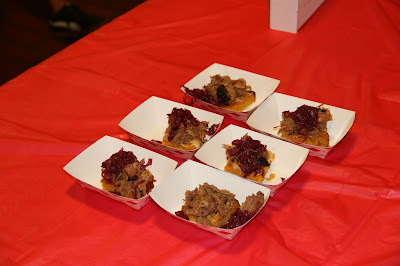 Another first occurred when we saw the first ever tie for the Judges’ Choice award. The judges’ panel was a prestigious one featuring Ronnie Killen, Alison Cook, Robert Lerma, Wayne Mueller and D’Artagnan Bebel. 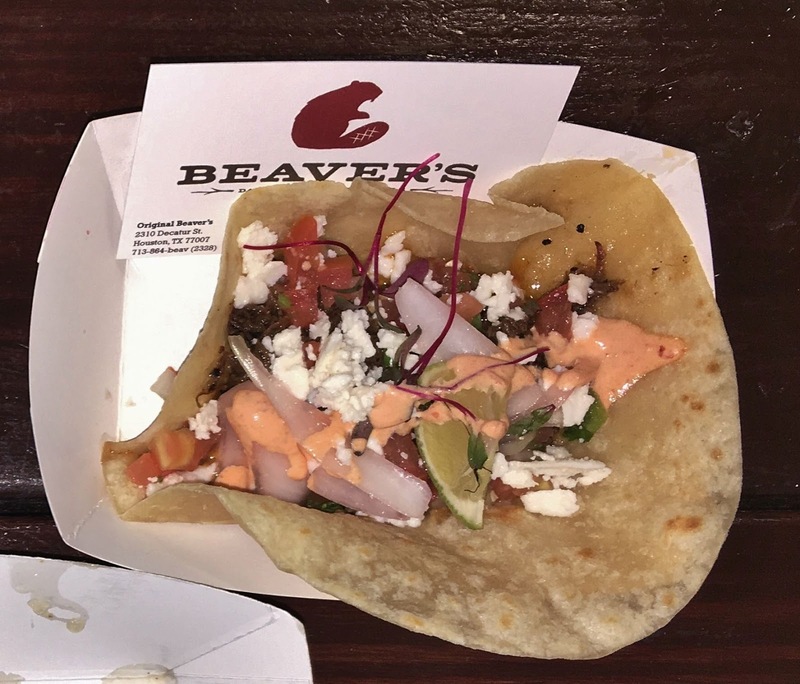 The judges’ decision was split on the dishes of two of the event’s newcomers: El Burro & The Bull with their pozole and the tacos from Beaver’s Westheimer. Speaking of newcomers, six of the fourteen competitors were first-timers to the event. This included Beaver’s, El Burro and the Bull, Gatlin’s BBQ, Harlem Road Texas BBQ, Pinkerton’s Barbecue and My Yard Reaction BBQ (which was a new name on the lips of many, including mine). Every entry was terrific, but the bites from Feges, Pit Room and Blood Brothers were among my unheralded favorites. For the second year in a row, my personal vote went to Feges’ entry. I am apparently prepared to be customer #1 when Patrick finally finds himself a permanent location. During the event, the folks at the Throwdown also announced an exciting Houston Vs. Austin event scheduled for this December. 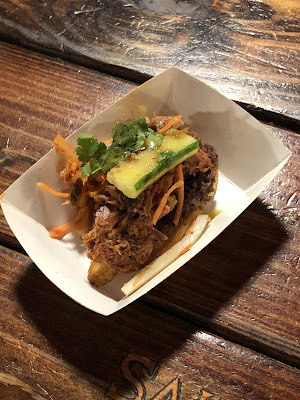 If you’ve never been to a Houston BBQ Throwdown, that should be a great opportunity to see the most creative (and tasty) event yet. If you’ve spoken to me on the topic, then you know that the Houston Barbecue Throwdown is my favorite barbecue event of all. 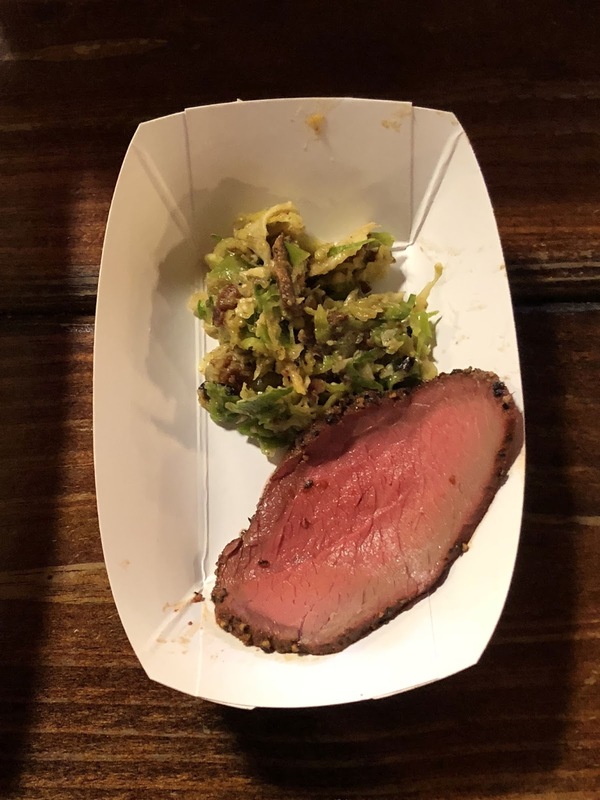 Instead of doling out the usual brisket, participants assemble unique offerings for attendees. 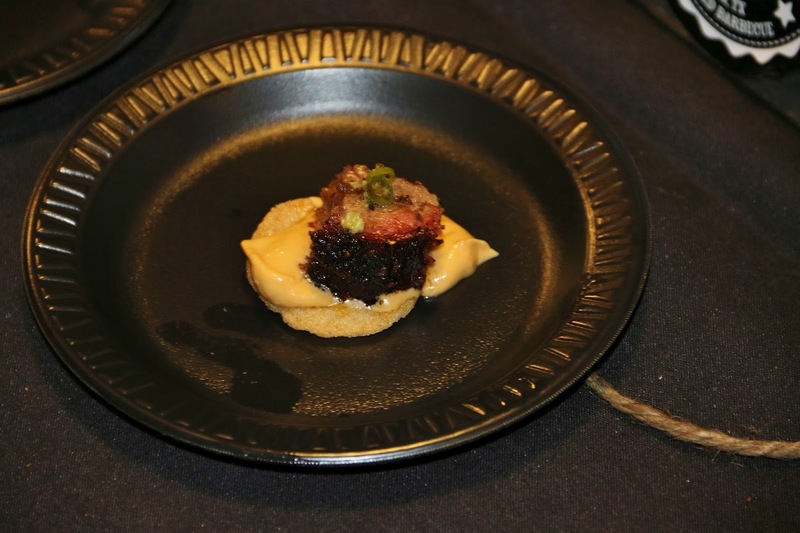 The creativity displayed at the Throwdown pushes the thought of “brisket fatigue” far from anyone’s mind. This year’s Houston Barbecue festival took a page from that event as many participants shied away from the common brisket offering. At times, the 2017 Houston Barbecue Festival really felt like a giant Houston Barbecue Throwdown. Offerings like Feges’ whole hog (though this is kind of a tradition now) and The Pit Room’s Iberico suckling pigs made for good pictures on social media, but many other participants bucked the beef trend and put together other entries that had people talking. These events represent a large cost investment for the participating restaurants and there are two thoughts into how to get value from such an event. We had a few participants that used the event as an opportunity to build their brand and show Houston what they could do. 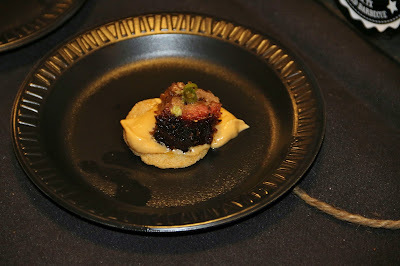 Tejas Chocolate Craftory, for example put together an entire bite sized spread for attendees, showcasing their meats, sides and desserts. Other participants used the event for R&D and experimented on the hungry masses in the NRG parking lot. 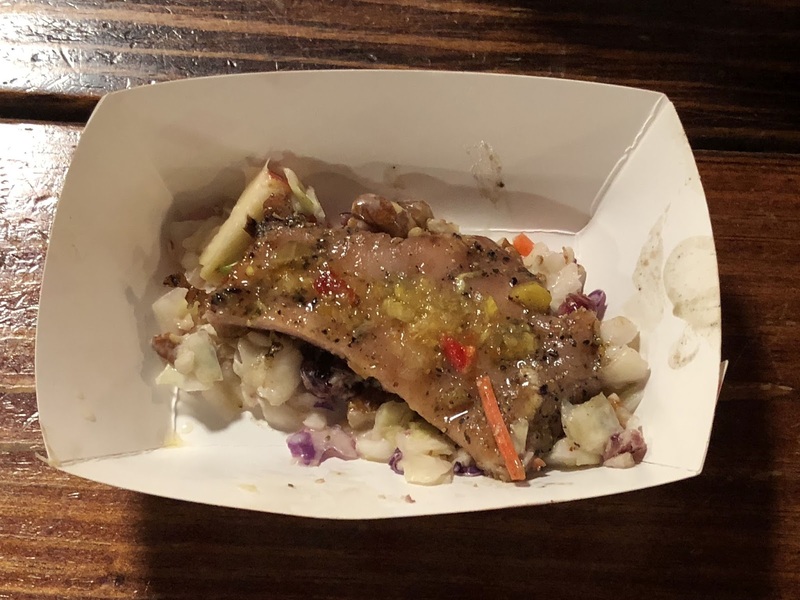 Names like Gatlin’s, Corkscrew, and Killen, for example, are well known commodities, so all three had the opportunity to try something new and get feedback from patrons as well as those on the local food beat. 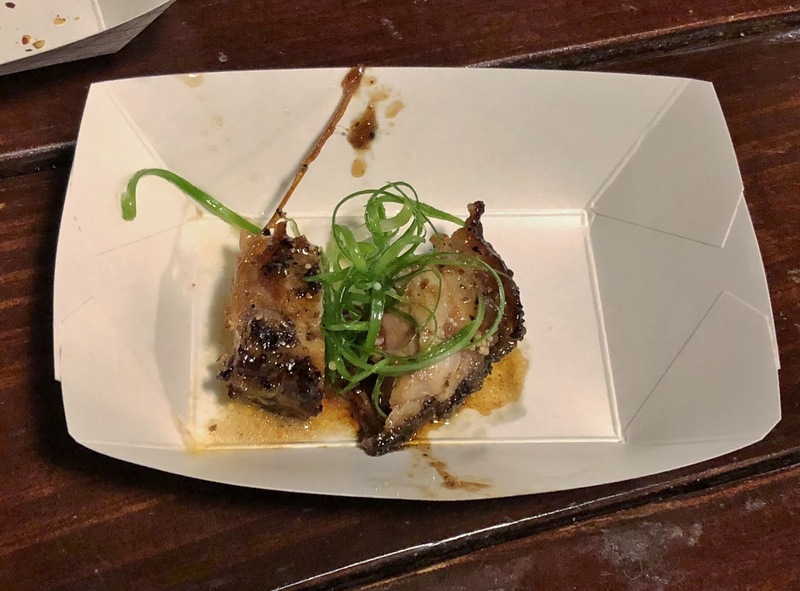 Perhaps, we’ll see some of the items from the weekend pop up on the menu of your favorite joint (Pinkerton's Bacon Wrapped Duck Sausage anyone?). My main mission this year was to sample the offerings from all 25 attendees. That mission was a success, however, as usual, some of the joints had different items available for VIP than for the general admission tickets. Pinkerton’s even had a rotating menu throughout the day with a new item available at the top of each hour. 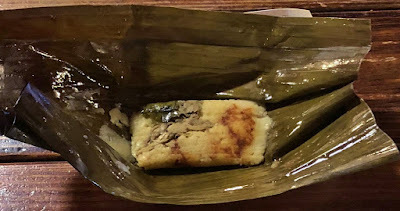 At times, I was chasing down one item and I’d miss out on another, like Gatlin’s smoked red snapper. 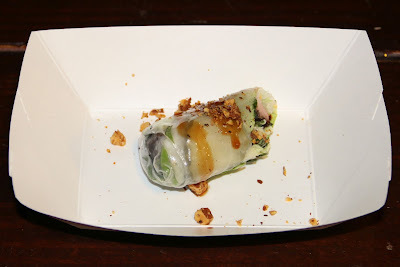 So, while I sampled all 25 venues, I did miss out on some of their offerings through the day. 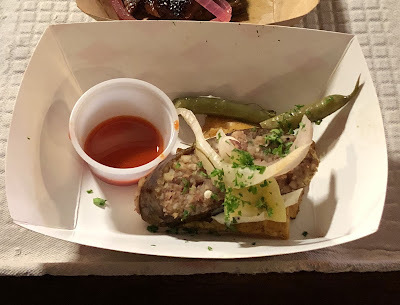 Harlem Road Texas Barbecue: Pork Belly Topped With Gourmet Pickle and Brisket on Sourdough Baguette.